Browse through a gallery of photographs documenting 50 extraordinary years of Jane Goodall's work. 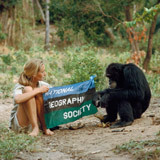 Take a look back at the historic National Geographic articles that brought Jane Goodall's work with Gombe's chimpanzees to the world. Read about the primatologist's work with the chimpanzees of Gombe, Tanzania, and learn about conservation efforts in Africa and elsewhere. 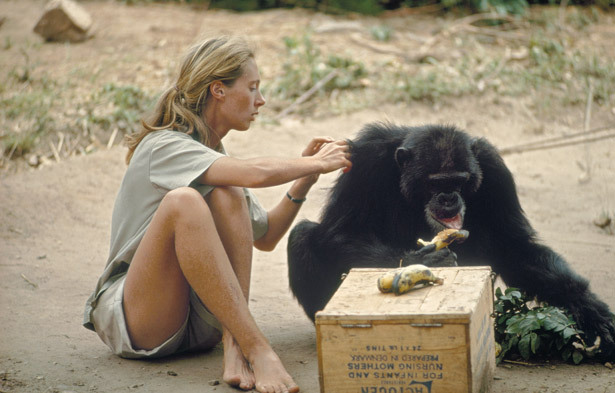 In 1960 a spirited animal lover with no scientific training set up camp in Tanganyika’s Gombe Stream Game Reserve to observe chimpanzees. 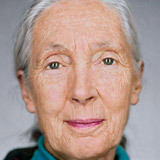 Today Jane Goodall’s name is synonymous with the protection of a beloved species. At Gombe—one of the longest, most detailed studies of any wild animal—revelations about chimps keep coming. Most of us don't enter upon our life's destiny at any neatly discernible time. Jane Goodall did. On the morning of July 14, 1960, she stepped onto a pebble beach along a remote stretch of the east shore of Lake Tanganyika. It was her first arrival at what was then called the Gombe Stream Game Reserve, a small protected area that had been established by the British colonial government back in 1943. She had brought a tent, a few tin plates, a cup without a handle, a shoddy pair of binoculars, an African cook named Dominic, and—as a companion, at the insistence of people who feared for her safety in the wilds of pre-independence Tanganyika—her mother. She had come to study chimpanzees. Or anyway, to try. Casual observers expected her to fail. One person, the paleontologist Louis Leakey, who had recruited her to the task up in Nairobi, believed she might succeed.